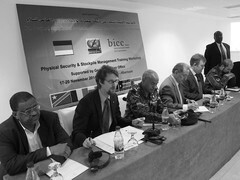 From 16 to 20 November 2014, BICC is supporting a regional Pysical Security and Stockpile Management (PSSM) for Arms and Ammunition Training Course, which is organized by the Sub-regional Arms Control Mechanism (SARCOM) in Khartoum, Sudan. The course is attended by some 30 participants from Central African Republic, Chad, Democratic Republic of Congo, Mali, South Sudan and Sudan. In addition to BICC staff, the trainers include representatives from the Military Verification Centers in Austria and Germany, as well as Professor Paul Holtom of the University of Coventry. BICC has been supporting the SARCOM mechanism since its inception in May 2012. The training workshop is supported by the German Foreign Office.